The countermovement jump, also known as CMJ is a jump that involves a countermovement. 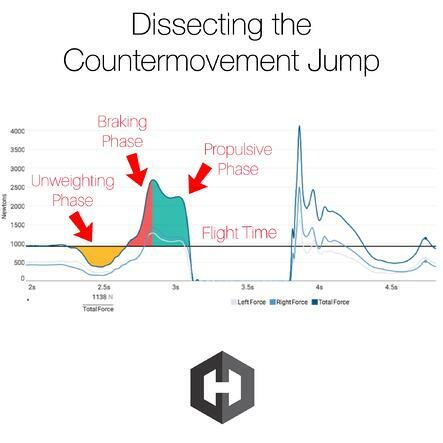 Hence why the name of the jump is “countermovement” jump. 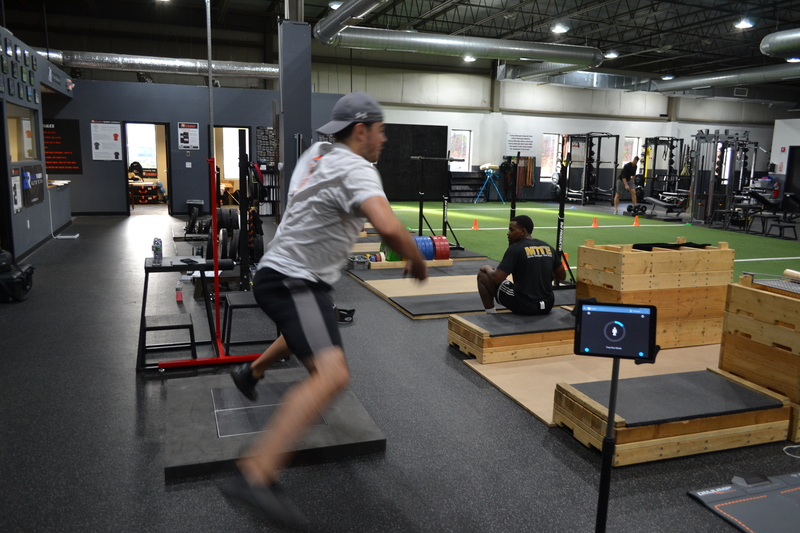 It is the jump that you typically think of when you think of a vertical jump assessment. A countermovement at its most simplest form is a downward action followed by a reciprocal upward action. In this case, it would be the lengthening of certain muscles as the athlete begins to lower down pre-jump. When the athlete reaches the bottom of their pre-jump, they briefly pause (i.e. isometric or amortization phase) before beginning the concentric muscle actions (e.g. propulsive phase) that produce the vertical jump. When looking at the CMJ as a whole, it is a combination of muscles lengthening and shortening in order to produce a goal (i.e. the jump). Research shows that the CMJ yields a jump height that is greater than it’s squat jump (SJ) counterpart. Typically a 20-30% increase above the SJ height, although this may not always be the case (1). For example, a very strong athlete with poor ability to effectively transfer energy may yield a SJ that is higher than the CMJ. 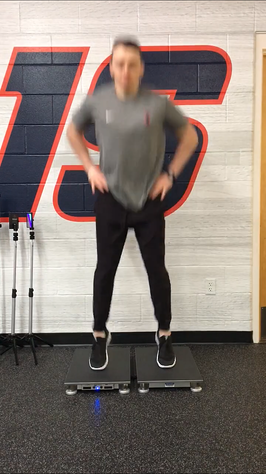 We have seen this before, and typically this is the athlete that spends a lot of time working on absolute strength and fails to incorporate any plyometric movement in their training. Other times this may just be the athlete that really doesn’t have the motor control to coordinate the jump effectively. As mentioned above, the majority of the time the CMJ height will be higher. This is because the CMJ harnesses the capabilities of the powerful stretch reflex, also known as the stretch-shortening cycle (SSC). The SSC uses the qualities of the contractile component (e.g. muscle, namely actin & myosin), series elastic components (e.g. tendons, structural proteins, and cross-bridges) and also the parallel elastic component (e.g. sarcolemma and fascia) (2). It harnesses the ability of these structures to work together to effectively transfer energy from the muscles that initiate movement, all the way down the kinetic chain to the toes prior to take-off. Working it’s way down the kinetic chain, this energy is transferred in alternating patterns of muscle, tendon, bone, muscle, tendon, bone, and so on. Fascia, ligaments, and other anatomical structures are also involved in this transfer of energy. The SSC is vital for all athletic movement because it harnesses the ability to use the stored elastic energy in the series elastic components (SEC). Although there are multiple components of the SEC, the tendons are essentially the workhorse in terms of energy storage. They have the ability to significantly limit the metabolic cost of locomotion when utilized to their full capacity. This not only allows an athlete to optimally transfer energy and power through the body, but also to conserve valuable energy. Which is arguably more important for an athlete. If an athlete can conserve energy via optimal muscle firing and efficient transfer of energy, then that athlete will theoretically have more energy throughout the competition or event. Now that we have discussed the CMJ and mechanisms behind it, it is now time to introduce the SJ and how to perform it. In order to perform a SJ you first should have the athlete stand on the force plate with their hands on their hips. Next, have the athlete “squat” down to a self-selected depth. This self-selected depth should be the equivalent depth that the athlete uses in the bottom of their typical countermovement jump. Some researchers suggest that 90 degrees knee flexion should be used as the starting depth for a SJ. For research purposes, this may be more accurate to standardize across subjects. However, in a practical setting it might make more sense to have them start at a depth that is specific to their individual jump; that is unless you are using the SJ to compare to research-derived norms. Either way you do it, make sure you have a reason behind it. Our software makes the SJ very easy to perform. One of the biggest limitations coaches and practitioners often have is classifying a CMJ from a SJ when performing an assessment. Without a force plate, a coach must use a “coaches eye” and hope to catch the very quick countermovement strategy that the athlete may use in order to jump higher. A lot of times, this countermovement may happen in the blink of an eye (i.e. milliseconds) and be very difficult to see in real-time. Researchers at MIT concluded that the human eye can identify images seen for as little as 13 milliseconds (3). Anything around this timeframe may be difficult for a human to accurately pick-up. This can make it very difficult to see a slight dip, or countermovement that the athlete may use to achieve a higher jump. 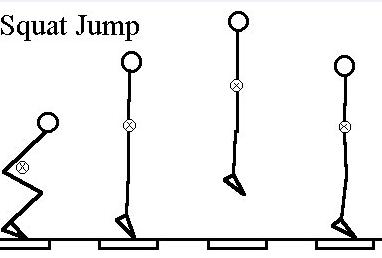 When performing a SJ on the Hawkin Dynamics force plates, you are able to see this slight dip “countermovement” that the athlete uses to produce the jump (around the 2-second mark below). Better yet, we have a Newton’s threshold build into our system. This means that if an athlete uses a countermovement than is 5% below system weight of the quiet phase then our system will automatically detect this, and not save the SJ attempt. This ensures that a true SJ is being completed by the athlete to help give the coach or practitioner a more valid assessment. Why are the CMJ and SJ useful assessments? The CMJ and SJ are both useful for assessing athletic performance. The two jumps can be used for readiness (i.e. 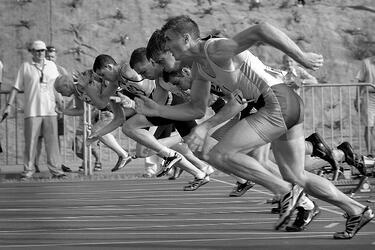 determining the current state of your athletes), as well as a before and after training assessment. The CMJ is more of an assessment that looks at the ability to effectively transfer energy into a jump. It is typically completed with hands on hips “akimbo”, but can also be completed using an arm swing. If the arm swing is included, the CMJ then becomes more of an assessment that is looking at whole body coordination and transfer of energy. With arms, the CMJ becomes more of a skill assessment. On the contrary, the SJ is more of an assessment of true force production. Some researchers might call this a measure of acceleration ability. However you look at it, it is a measure of force production from zero movement (i.e. no countermovement involved). It is typically much more difficult for an athlete to perform because they usually have limited experience with it. Considering this, it may be a good idea to have the athlete practice the SJ a couple times prior to having them complete a SJ for an assessment value. Any way you look at it, the CMJ and SJ are both very useful when looking to assess an athlete. Both jumps tell you different things, and are also capable of showing changes overtime. Bosco C, Montanari G, Ribacchi R, Giovenali P, Latteri F, Iachelli G, Faina M, Coli R, Dal Monte A, Las Rosa M, Cortelli G, and Saibene F. Relationship between the efficiency of muscular work during jumping and the energetic of running. Eur J Appl Physiol56: 138-143, 1987. Turner, A.N., & Jeffreys, I. (2010). The Stretch-shortening Cycle: Proposed Mechanisms and Methods for Enhancement.